Which one will emerge victorious from our face-off? We've passed through the hell of our addiction to Tiny Tower: we obsessed over it, kept a careful watch over it day and night in order to beat our friends to become the owner of the tallest skyscraper and then, at some point, we simply stopped caring. It was probably the moment we shelled out for our first Tower Bux, and then realized that this wasn't so much a game as it was an aspirational peacock's tail, something that was nice to show off but was ultimately unrewarding to play. We can't deny it held our attention obsessively though. Now that successor Pocket Planes has been out for a week, it's the perfect time to see which of these two games is Nimblebit's ultimate pocket management sim. 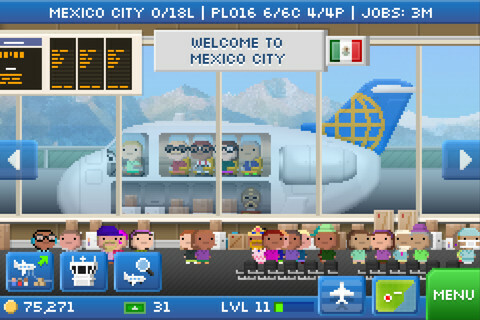 While Nimblebit has carved out a pixelated art style all of its own, the simple fact is that Pocket Planes offers up far more variety in color and characters. With many, many more customization options available for both your pilot and planes, you can really make the game world feel like your own. By contrast, there was only so much you could see in Tiny Tower that really felt new, and a part of your own sim world. Tiny Tower's simplicity was its most addictive strength: the mechanics were transparent and easily understood from the off, with only your time and attention the measures of success. If you turned up dutifully, maximized your earning potential and optimized your workers and residents, you could disappear back to the humdrum of work, making as much progress as anyone else. We stopped short of setting alarms for the middle of the night, but it was a close call. 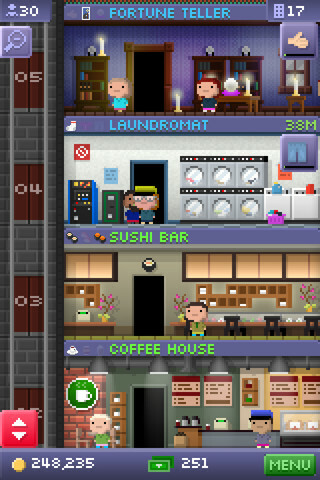 So while Tiny Tower might have been pure addiction, the gameplay was comparatively shallow. 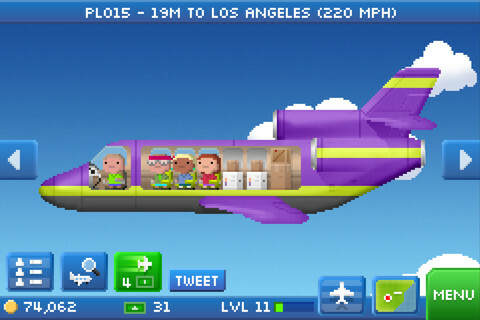 We much prefer to settle down to a play session with Pocket Planes. While much of the game remains hands-off, far more of your time is spent strategically planning routes. Even when all of your planes are up in the air, there's plenty of strategizing to be done on the ground as you work out your next expansion. Finish that and more often than not, you'll be ready to reschedule your flights. Perfect. Let's be honest, Tiny Tower was all about staying one step ahead of your friends as you admired your blossoming skyscraper that couldn't, mustn't ever fall behind the height of your competitors'. It didn't really matter if yours was rubbish, as long as it was less rubbish than anyone on your friends list! Pocket Planes on the other hand is a fantastic little co-op title where you can take on challenges with friends rather than compete against them. Head to the Flight Crew section, share your crew name with your buddies, and set off on a collaborative adventure to earn some serious money from the in-game events. Ah, the money. 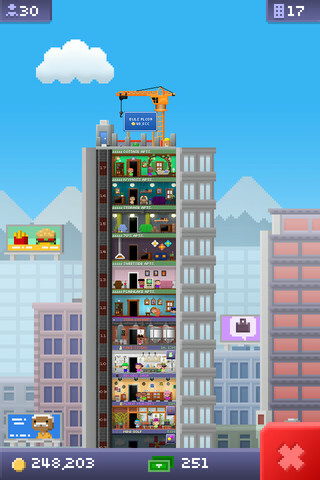 Could you resist the lure of the Tiny Tower app-bought Bux? We couldn't, and we found ourselves guiltily dipping in, making the socially competitive element of the game end up feeling rather pointless. We couldn't bear the thought of a friend having an unfair advantage: they must be cheating, so we might as well do it first! It all became a bit cynical rather quickly. It's certainly tempting to dip into the real-money advantages to be found in Pocket Plane's store for a rapid expansion, but there's so much to do that you almost feel overwhelmed at the thought of increasing your airports and plane fleet before you're ready to do so through the natural passage of gameplay. We'll probably give in eventually, but for now we're being kept nice and busy with the free content. If we were to wonder out loud what the most addictive of the two games was, then Tiny Tower would almost certainly triumph: the compulsion to play was certainly stronger, but the gameplay suffered through its obsessive simplicity. If you're going to ask us which is a better game on the other hand, then we find that a very easy question to answer: it's Pocket Planes. With more complexity, a greater sense of control over progress, and much less pressure to invest heavily in the app store, we may not obsess over it quite as much as we did with its predecessor, but we definitely prefer it when we're actually playing.